Yes indeed it is. I do not like change. I realized this early this year as my life was moving quickly from one change to another. I used to think I liked change but the reality is I just get comfortable with where I am and unless something really forces me to change, well a lot of times I don’t change. Even the thought of writing about my dislike of change brought me to a place of procrastination. This is actually pretty much my regular repertoire. God is working on me though. He is really stretching me to step out of my comfort zone. This blog is really a stretch outside of my comfort zone to be honest. But if we don’t allow Jesus to change us then we may never realize our true potential. It has been three weeks since I started this post. The content flowed really well in my head and then somehow I just couldn’t bring the words to the keyboard. I have written and revised many times already but today I decided that it has been long enough so I need to get this done and posted. As I was walking to work on October 7th I was admiring the beautiful trees that had been changing colors and the leaves on the ground. I was feeling really lazy that morning and I didn’t really want to walk to work. It’s literally a 9 minute walk but there’s this hill that I absolutely dread every time. It’s really not a big hill but for me it has been a challenge. So as I am walking up that hill I was praying about how I didn’t like the hill and the Lord reminded me of something that was said to me not too long ago about how when things get hard I tend to stop and withdraw. Ouch! The reality of that truth hit me hard. I began to think about the hard things that I’ve endured in my life as I considered the idea of change. When I encounter change that is hard I tend to quit, give up or stay stagnant. Well life changes all the time. We have to either roll with it or we do become stagnant and quite frankly stagnant water stinks. When I was living under tremendous stress from abuse it took me a while to get out from under it because even though the situation was difficult it was something I thought I could control. I didn’t know what would happen if I just stepped out of that situation. All the “what if’s” were flooding my mind. What if I can’t get away fast enough? What if he finds me? What if something worse happens? What if I can’t find another man? What if I can’t handle raising my kids by myself? What if_______? I have to wonder how many women stay in abusive situations because it is just so much easier to endure than to change. I remember the first day I spent at a domestic violence shelter. I wouldn’t speak to anyone there with the exception of the staff. My head hung down and I never looked up to speak to anyone when they tried to talk to me. I didn’t want to be there. I didn’t want to have my life turned upside down. I just wanted to go back home to the life I was used to and even though it was difficult I knew the routines. I knew how to walk on eggshells and I was familiar with playing the game of pretending that I was happy. Now I was in this house with 8 other women who had their own stories. It took me three days before I was able to talk to anyone. There was a sweet woman on staff who took me aside and forced me to look at myself in the mirror. She challenged me to say I love you to the reflection that stared back at me all battered and bruised. I couldn’t say it. I cried. She challenged me to keep going back to that mirror until I could say it. It took a while but a few days later I said it. That simple act helped me to begin to speak with the other women. It would be many years before I could truly look in the mirror and say I love you to myself. Even though I was able to say it back then at the shelter and it helped a little bit the real change of beginning to love myself didn’t start to take affect on my life until I began to surrender my life to Jesus. Still it took another several years for me to really understand love and to receive love. All these memories came flooding into my mind that breezy beautiful morning three weeks ago as I walked up that hill. When I got to the top of the hill I smiled and yelled “Thank You Jesus”. I walked the rest of the way with a quickness in my step and a smile on my face as I realized that just as I had conquered the hill that morning I could conquer anything because truly I can do all things through Christ. So I planned to write this blog post that day and somehow I just couldn’t get it together. The result of that day and then the candlelight vigil the next day began a journey of self discovery over the past three weeks. Now that I have finally finished this entry I believe I can go on to share some of the lessons I have had over this short period of time. I will continue to talk about change in the next post. God bless each and every one of you that has read this blog today. I would appreciate your feedback. How many times will The Lord tell me that He is with me? How many times will He tell me to NOT be afraid? How many times will I hear the words and it just doesn’t sink in? When will I get it? When will I live it? This is a command not a suggestion. I have to wonder if Joshua was like me in that he heard the words but didn’t really believe it. I mean God told Joshua several times as well and we only know the times recorded in the scriptures. I’m sure that there is a reason that He told Joshua several times and if I’m right then Joshua and I have some things in common. Lack of confidence! Fear! Feeling weak and vulnerable! I’m sure it was a little different for Joshua since he was a man and all. I just know that for the past four years God continues to remind me of this command. He is with me wherever I go. God is with me wherever I go. Wow! That’s powerful. So if it is true that God is with me wherever I go then there really is no reason to be afraid. In human perspective I guess it’s like having your big strong father or big strong brother with you all the time. No bullies would think about messing with you when you have a big strong father or brother with you. Right? So why do I still fear, lack courage and become dismayed? Unbelief. I don’t really believe it. I don’t like admitting that but it has to be true. We act on our beliefs, right? So if I truly believed that God is with me everywhere I go then I would never be afraid. I could walk in confidence knowing my Heavenly Father has my back in all circumstances. All! As in everything! Everywhere! I pray that this will become a truth in my life. I pray that the Holy Spirit will bring such revelation to my spirit that I will no longer need The Lord to remind me of this verse because it will be so ingrained in my life that no reminder will be necessary. It will be lived out in every breath I take, every step I take, every moment, every day of my life. Let it start today Lord. In Jesus name. 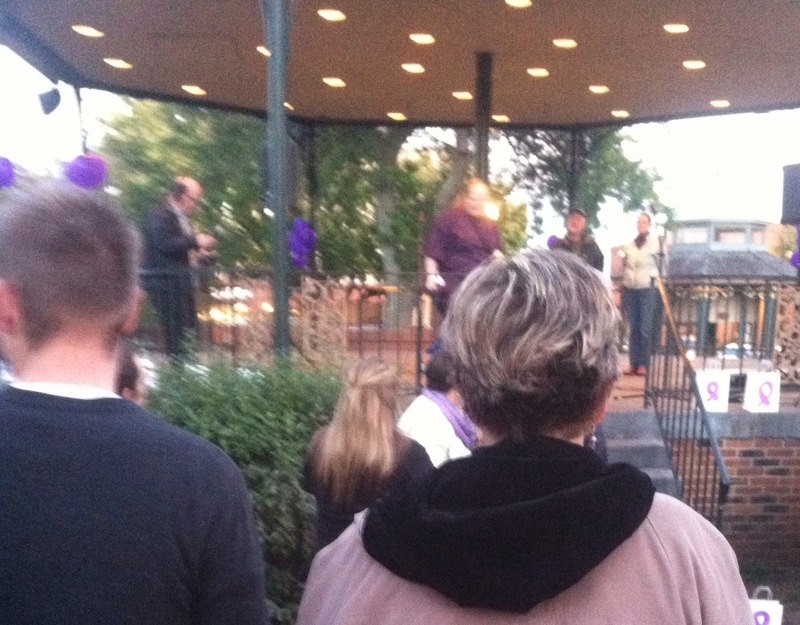 I attended our town’s Domestic Violence Awareness Candlelight Vigil tonight on the town square. Even though I am a survivor of many years this is the first time I have attended a vigil. I would never go because I was afraid that someone would see me and know “that girl is tainted”. I really agonized over going as if it was a major event like going to see the Queen of England or something. You see when the scars fade and the wounds heal no one knows. I think of all the times I have suffered abuse from many sources and the one thing I was able to do was hide it. I was able to pretend like nothing was wrong. I kept to myself, I didn’t talk to anyone. People just thought I was like a mean bully or something. Seriously I had someone tell me that. But the truth is I was protecting myself. I was protecting my heart inside a stone brick wall because I had promised myself that no one else would hurt me. That wall kept me from building relationships at work, relationships at church and relationships inside my very own family. 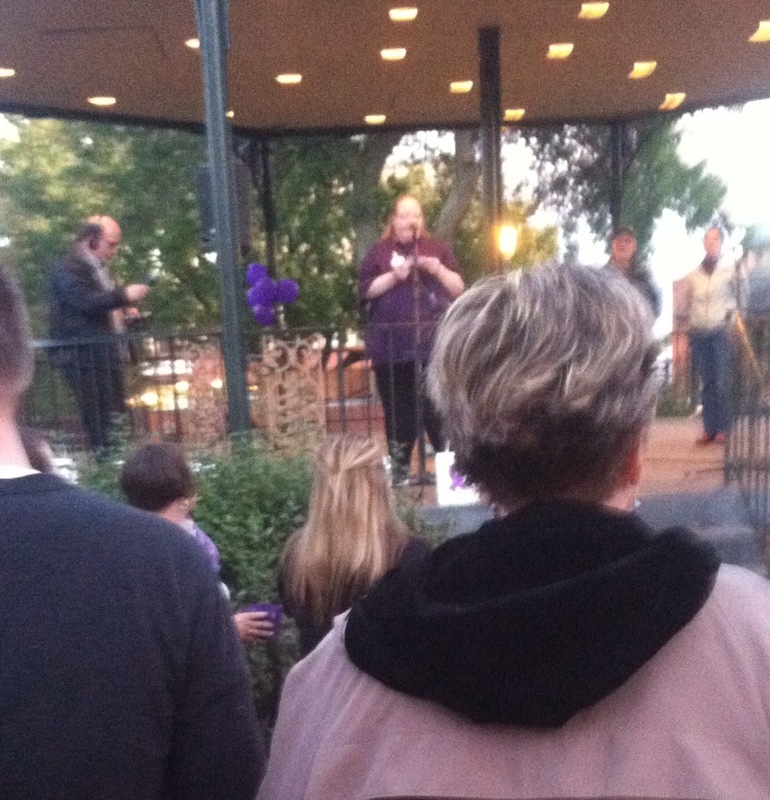 There was an angst inside me when I went to the vigil and I stood there listening to a survivor tell her story. The courage to open up and say look at me “I’m a survivor” is huge. I listened as she talked about the reasons she stayed and I recalled my own reasons. There are always reasons. Abusers fill their partners heads with so many lies that it’s hard to know what thoughts are their own. Abusers manipulate and control their partners to the point where that have no voice, no friends, no family, no resources…only the abuser. Then once you are so accustomed to the isolation and the lies take over your very own thoughts…you can not see a way out. It takes much courage to walk away from everything you know and start over. But change is necessary. It’s actually a constant in life. Tomorrow I want to share a message with you about change that I put together yesterday morning while walking to work. I hope that you will return for the message. 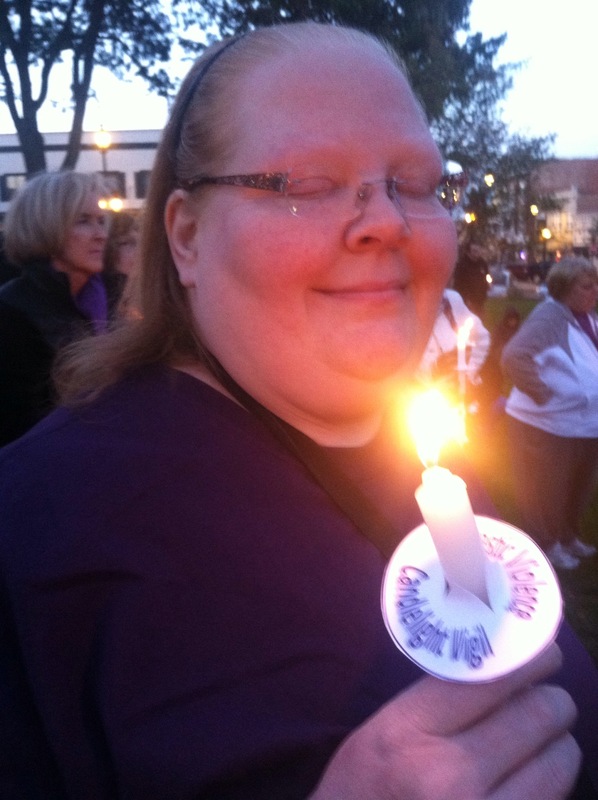 Below are pictures of me from tonight’s vigil. I didn’t know what to expect and they asked for people to come up and read an inspirational quote. I went up there and did it. I looked out into that audience and it did not matter if they knew I was a victim of domestic violence because the truth is I’m a Survivor! Thank you for stopping by today! God bless! That short list ended up being even shorter because my sole focus became my weight. I had ups and downs, successes and failures but I mostly wrote about the failures once they turned to successes. Sadly I only saw the failures in my life. Well I have come a long way from that mindset not that I have arrived and don’t struggle but today I can see my successes as well as my failures. The victory in that is I am able to celebrate my victories and I don’t focus so much on the failures. Today I am committing to keep both of these blogs alive. My weight journey will remain at Losing4Christ and my life journey will be here. First I want to say that I chose this day for my launch because as I looked over the path that my life has taken over the years and have found pivotal dates where I know I can say for certain that I had a life transformation. Saturday October 4, 2008 was one of those days. Besides that October is Domestic Violence Awareness Month and I am a survivor! I hope this site will become a place where people who are living under abuse and trying to get out will be able to come to for resources, hope, prayer, encouragement and at some point tangible help. I know that many people who visit here will not believe the way I do and I am OK with that. I can only share what Jesus Christ has done for me and be a safe place for people to come and be encouraged. Today you know someone who has been or is being abused. How do I know that? Because the statistics tell me so. You are reading this page and maybe you have a friend who is in an abusive relationship and you have no idea what to say or do. Send them my way. I can’t help everyone but if I can help just one then it will be worth it. Check out my about page and see the other obstacles I have overcome because of Christ working in my life. Before I end today I just want it to be clear that this site is not just about abuse. It is about a life transformed by the power of God! I am that life and I have been transformed. People who have known me for a long time can tell you I am not the person I was 5, 10, 15, 20 years ago. Frankly I am not even the same person I was a year ago. I am a follower of Jesus Christ, the One who brought me up from the miry clay and set my feet on solid ground. I believe that He is more than able to deliver and set people free from all the things that cause us to live in a miry clay pit of destruction. Thank you for stopping by and please feel free to share this site.